This UES newcomer is a no-fuss starter with about 20 wines available by the glass and around 150 by the bottle. With live piano music, quirky Madeline illustrations on the walls, and dark wood and leather accents, this bar has a great, old-world charm. The copper-topped bar, dapper bartenders, and extensive whiskey selection will evoke memories of the good old days. With more than 500 bottles to choose from here, there’s a wine to satisfy the most discerning tastes. 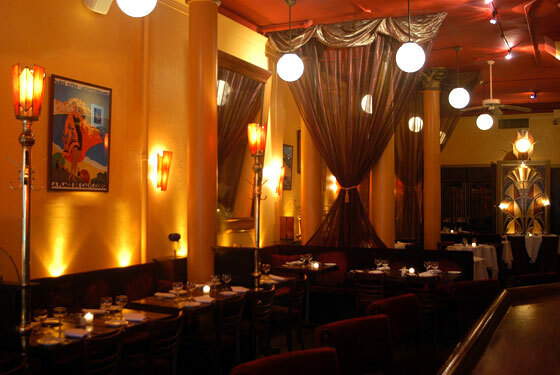 Traditional French cuisine and live jazz are a simple, can’t-miss recipe for romance. The newly designed regional Italian menu at this sleek downtown spot means modern meals that have roots in classic favorites. The evening features new interpretations from the Duke (“Mood Indigo,” “Satin Doll”) by Wess Anderson, Houston Person, and Scott Hamilton. A perfect show for aficionados who want to hear works of the greats while supporting the next generation of artists. BAM’s screening of the 1940 Cary Grant screwball romance, His Girl Friday, is paired with a prix fixe at the charming in-house café. Scotch, chocolates, travel sets, and more. Earrings, vases, rings, and more. Susan Wadsworth, founder, nonprofit for young classical musicians. Charles Wadsworth, classical pianist and artistic-festival director. Relationship status: Married 41 years. Living together on the Upper East Side.